November 22, 1963 is a very somber date in American History. 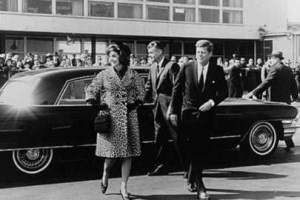 John Fitzgerald Kennedy, 35th President of the United States, was assassinated that Friday afternoon in Dallas, Texas. The United States had great optimism when John F. Kennedy was sworn into office in 1961. His election symbolized the passing of power to another generation. He is still the youngest person ever elected President at age 43. The greatest setback of the Kennedy Administration was the Bay of Pigs Invasion, when a failed attempt was made to invade Cuba by CIA guided insurgents. The greatest achievement of the Kennedy Administration was resolution of the Cuban Missile Crisis, when the United States blockaded Cuba by sea to prevent nuclear missiles from being placed there by the former Soviet Union (unknown at that time, the missiles were already in place). Lesser known about the Kennedy Administration was that it was fiscally conservative. JFK believed in a strong dollar and tight Federal spending. With large sums of capital being exported to Europe in 1962, a 7% Domestic Investment Tax Credit was enacted to stimulate the construction of factories at home. There was great fear that massive job exportation to Europe would undermine domestic manufacturing. JFK was thinking long term, but his life was cut short, and by the 1970s just about all manufacturing jobs in the consumer electronics industry were lost. John F. Kennedy was assassinated in Dallas by Lee Harvey Oswald. The President's motorcade slowed and turned twice as it made its way through Dealey Plaza. From a 6th floor window of the Texas Book Depository Building, Oswald fired three shots at the President, two of which struck and killed him. News about the assassination spread frenetically, with the entire nation in shock. November 22, 1963 is one of few dates in American History that provokes a reaction of instant recall for most of those who lived through it. Several investigations into the assassination immediately ensued. In 1964, the Warren Commission concluded that Lee Harvey Oswald had acted alone. Many conspiracy theories were then generated, from an Oswald-CIA connection to a Cuban plot to cause American chaos, and the commission's conclusions were mocked by skeptics. A single bullet had struck both JFK and Texas Governor John Connally Jr., which became known as The Magic Bullet due to its great velocity and damage it had done. In recent years, feasibility studies have been done to deduce if Oswald had the mode, means, and opportunity to carry out the assassination all alone. Oswald owned the weapon, and was an excellent marksman. Later marksmen have easily replicated the firing of a similar weapon in the same short time span (about 6 seconds). Oswald had access to the building, and had enough time to walk downstairs to the lower floor where a policeman spotted him after the deadly shots were fired. He also had time to walk to the nearby theater and still fit the time parameters. Oswald's brother described him as lonely, frustrated, and capable of such a crime. The assassination of John F. Kennedy was an extremely somber and tragic event. Along with JFK, many "high hopes" were dashed as the country entered into the tumultuous 1960s. The United States Of America eventually accomplished JFK's ambitious dream of safely landing a man on the moon by the end of the decade, achieved on July 20, 1969.